Welcome to our live blog from the College Station City Council’s workshop and regular meetings on Thursday, Sept. 27. It’s not the official minutes. Towing Ordinance: The proposed amendment would add any motor vehicle unlawfully parked or violating any city code may be towed at the owner’s or operator’s expense. The council discussed possible amendments to city ordinances to provide more consistent code enforcement. Points of discussion include open storage, vegetation, right-of-way maintenance, abandoned shopping carts, and the parking or storing of recreational vehicles, trailers or trucks. Mayor Mooney presented a proclamation for College Station firefighters’ “Fill the Boot” campaign to benefit the Muscular Dystrophy Association. James Benham recognized Marine Cpl. Richard Waller as part of the Fallen Heroes Memorial program. The 22-year-old Fort Worth native died April 7, 2006, while conducting combat operations in Al Anbar province, Iraq. Justin Ikpo spoke about criminal behavior in his neighborhood. A BuyBoard contract purchase of $138,750 for traffic signal cabinets from Paradigm Traffic Systems Inc. Renewal of a $230,000 Xpedient Mail contract for printing and mailing services. The expenditure of funds for FY19 for items exempt from competitive bidding and other expenditures for inter-local contracts or fees mandated by state law that are greater than $100,000. Adopted fees, rates and charges as provided by Chapter 2 of the city’s Code of Ordinances. An increase the FY18 expenditure limit by $55,000 for a new FY 2018 expenditure limit of $145,000 for police uniforms, body armor and accessories from Miller Uniforms & Emblems. Added language to city ordinances for towing unlawfully parked vehicles. Amended city ordinances related to home solicitation. A contract for the grant of federal HOME Investment Partnership Program Grant Community Housing Development Organization (CHDO) set-aside funds with Elder-Aid, Inc. in the amount of $200,000 for acquisition and rehabilitation of two dwelling units at 3416-3418 Normand to be used as affordable rental housing for income-eligible elderly households. The $54,224.50 purchase of traffic signs, prefabricated signs and sign blanks from Vulcan Signs Inc. for and the $61,585 purchase of traffic sign hardware and posts from Dobie Supply. An advance funding agreement with the State of Texas, acting through the Texas Department of Transportation, for the Cain/Deacon project. Six master agreements for Real Estate Appraisal Services: Duff & Phelps, LLC; JLL Valuation & Advisory Services, LLC; Lowery Property Advisors, LLC; Paul Hornsby & Company; S.T. Lovett & Associates; Valbridge Property Advisors. Amended the funding agreement with Experience Bryan College Station to increase the amount for FY18 by $194,423 for a total of $594,423 related to the CVB Grant Program. The second reading on a non-exclusive pipeline franchise ordinance with Hawkwood Energy Midstream for pipeline facilities for transporting petroleum products and byproducts. Amended the city’s Code of Ordinances regarding false alarm fees. Amended the city’s Code of Ordinances regarding Fire Department and Planning and Development Services afterhours inspection fees. Changes to guidelines for the city’s housing assistance program funded with grants from the U. S. Department of Housing and Urban Development. FY19 premiums not to exceed $516,000 for excess liability and workers’ compensation insurance, property/boiler & machinery, commercial crime, EMT liability, auto property damage, cyber liability, unmanned aircraft liability and property, and special events policies. After a public hearing, the council approved a $3.8 million amendment to the FY18 city budget. See pages 282-284 for a list of amended items. The council unanimously approved the city budget for the 2018-19 fiscal year and ratified the increase in property tax revenue. The council unanimously adopted a property tax rate of .505841 cents per $100 of assessed value for FY19, a .08341-cent increase from the FY18 rate. 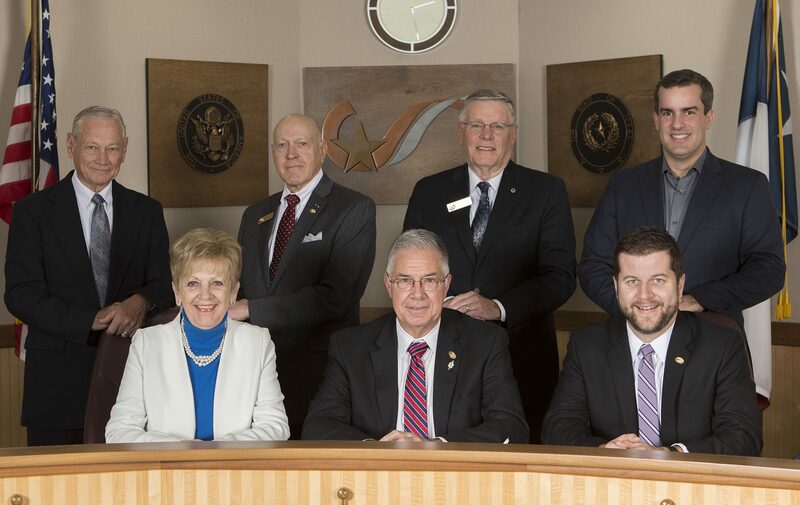 The council unanimously appointed Mayor Mooney to another term on the BVSWMA Board of Directors. Mayor Mooney adjourned the meeting. The council meets again on Thursday, Oct. 11. Welcome to our live blog from the College Station City Council’s workshop and regular meetings on Monday, Sept. 25. It’s not the official minutes. The workshop has started. Council took no action out of executive session. Councilman James Benham is absent tonight. Research Valley Partnership Bylaws: In June, the RVP voted to amend its bylaws. College Station, Bryan, Brazos County and other oversight entities must approve any changes to the bylaws concerning the appointment and qualifications of directors. A provision allows Texas A&M to join the RVP as a full-funding partner. Existing full-funding partners are the cities of Bryan, College Station and Brazos County, which invest about $350,000 each per year. Hot Mix Asphalt Contract: Four sealed competitive bids were received and opened in August 2015, and Brazos Paving was the lowest responsible bidder. The total contract award for Type D hot mix asphalt is $2,990,750 and the emulsion is $22,800 for a total not to exceed $3,013,550 for materials to be installed on city streets as needed. This is the second of two possible one-year renewals. Royder Road Interlocal Agreement: Due to the traffic impact of the proposed Wellborn Middle School, the need for a traffic signal at Greens Prairie Trail and Royder, a right-turn deceleration lane into the school, and the associated utility relocations were added to the city’s planned roadway project. A total budget of $4.93 million is included for this project in the Streets Capital Improvement Projects Fund. CSISD will reimburse the city up to $450,000 for the deceleration lane, traffic signal improvements, and necessary utility relocations. Arrington Road Interlocal Agreement: The agreement allows Brazos County to finance the improvements to Arrington Road in the College Station city limits. The county will provide property acquisition, grading, drainage, flexible base/asphalt pavement, pavement markings, permanent vegetation, and appropriate signage and maintenance. Hands-Free Ordinance Repeal: A new state law preempts a city ordinance that prohibits the use of a hand-held electronic communication device while driving. The Texas law simply bans texting while driving. Dark Fiber Lease Agreement: On March 26, 2015, council approved an Ordinance permitting the lease of city fiber optic cable facilities. This item is the second lease authorized by the ordinance. The lease will have a financial impact on the city since modest revenue will be obtained from fiber or conduit leases. The council reviewed the city’s efforts and programs to promote affordable housing. Joe Orr, Inc. was recognized by Mayor Mooney for receiving a Texas Treasure Business Award from the Texas Historical Commission. Joe Orr is one of only 383 businesses from across the state to make this prestigious list, which pays tribute to businesses that have provided employment opportunities and support to the state’s economy for 50 years or more. Pictured below with Mayor Mooney is Henry Mayo, Joe Orr’s vice president. Ben Roper recognized Marine Lance Cpl. Pedro Contreras as part of the Fallen Heroes Memorial Program. The 27-year-old from Harris, Texas, died from hostile fire on June 21, 2004, in Al Anbar Province, Iraq. Casey Oldham introduced Matt Prochaska as president and CEO of the Research Valley Partnership. Modifications to Article III of the Bylaws of the Research Valley Partnership, Inc.
FY18 funds for items exempt from competitive bidding as described in the Texas Local Government Code and other expenditures for interlocal contracts or fees mandated by state law greater than $100,000. First renewal of a $256,078.42 annual contract with Andrews Building Service for janitorial services for city facilities and the Northgate District. An interlocal agreement for the cost participation by the College Station Independent School District in the Royder Road Widening Phase I Project. Prohibited left turns for vehicles traveling northbound on Brothers Boulevard into the Southwood Valley parent pick-up and drop-off driveway 815 feet north of Deacon Drive. An interlocal agreement with Brazos County regarding Arrington Road. Authorized the city manager or his designee to execute documents necessary for a grant application for Criminal Justice Division funds from the Officer of the Governor. Prohibited parking on the west side of Boyett Street beginning 60 feet north of the intersection with University Drive and ending 130 feet north of University Drive. An amendment to the Brazos Valley Wide Area Communications System interlocal agreement that adds Grimes County as a BVWACS party. A bid award not to exceed $479,168 for the annual blanket purchase of three-phase pad-mounted transformers. An annual water meter purchase of a maximum amount of $463,000 with National Meter & Automation, Inc.
Repealed the city ordinance regarding the use of wireless communication devices while operating a motor vehicle or bicycle. A license agreement with Lakeridge Living for a 69.55-square-foot encroachment into the public utility easement located at 1198 Jones Butler Road. An agreement for CEO, Etc., to lease city fiber optic cable facilities. FY17 funding of $1,493,809 to Public Agency Retirement Services (PARS) OPEB trust. FY18 insurance premiums not to exceed $500,223 for excess liability and workers’ compensation, property/boiler & machinery, commercial crime, EMT liability, auto property damage, cyber liability and special events policies. The council voted 5-1 to approve an annual contract not to exceed $3,013,550 with Brazos Paving for Type D hot mix asphalt and emulsion. Councilwoman Julie Schultz voted against the motion. After a public hearing, the council unanimously approved Budget Amendment No. 3, which amends the FY17 budget by $114,357 and includes a contingency transfer of up to $400,000 to cover expenses related to hurricanes Harvey and Maria. The amendment includes $49,957 to cover expenses incurred by members of the Police Department to participate in the presidential inauguration in January. Another $4,000 is for expenses for a homicide investigation seminar hosted by CSPD. Funds for both of those items were subsequently reimbursed. In addition, the Fleet Maintenance Fund is expected to be over budget by about $60,000 because of unexpected expenses for parts, repairs, and overtime. The council voted unanimously to adopt the city’s $365.7 million budget for FY18 and 5-1 to ratify a $5.8 million increase in property tax revenue. Councilman Jerome Rektorik voted against the ratification. The council voted 5-1 to adopt the FY18 property tax rate of 49.75 cents per $100 of assessed valuation, which includes .220339 cents for debt service and .277161 cents for operations and maintenance. Councilman Jerome Rektorik voted against the motion. The 2½-cent increase from FY17 is entirely on the debt side and will be used to fund a new police station. The new rate is expected to generate about $43.3 million to fund the city’s general debt service and part of its operations and maintenance costs. Councilwoman Linda Harvell was not feeling well and has left the meeting. The council voted 5-0 to implement two changes to utility fees and rates. The first change establishes a unified account creation fee and deletes the existing connection fees that cause confusion and are not compatible with the city’s new billing system. The change simplifies the fee to create an account with College Station Utilities. The next item on tonight’s agenda establishes the amount of the account creation fee, which is revenue neutral. The second change implements a council decision from November to add a 50 percent surcharge to water and sewer customers in Brazos County Municipal Utility District No. 1, also known as the Speedway MUD or Southern Point development. The surcharge will help offset the cost of adding utility capacity to meet the development’s demands. It provides the same revenue as impact fees would but stretches it over 20 years. After a public hearing, the council voted 5-0 to approve a request to change the zoning designation from Rural to Suburban Commercial, Estate and Natural Areas Protected for about 35 acres northwest of the intersection of William D. Fitch Parkway and Rock Prairie Road. The change will allow for development. After a public hearing, the council voted 5-0 to deny a request to change the zoning designation from Rural to Restricted Suburban and Natural Areas Protected for about 46 acres east of the Emerald Forest Subdivision near the Carters Creek Wastewater Treatment Plant. The change would have allowed for a single-family residential development. After a public hearing, the council voted 5-0 to abandon a public utility easement at 203 First St. to allow for the development of the mobile food truck park in Northgate. After a public hearing, the council voted 5-0 to approve a request to change the zoning designation from Commercial Industrial to Multi-Family and Natural Areas Protected for about six acres on Associates Avenue behind Sam’s. The change will allow for a multi-family residential development. After a public hearing, the council voted 4-0 to approve a request to change the zoning designation from Rural to General Suburban for about 14 acres at 3387 Barron Cut-Off Road. The change will allow a single-family residential development. Councilwoman Julie Schultz recused herself from the discussion because of a conflict of interest. After a public hearing, the council voted 5-0 to approve a request to change the zoning designation from Rural to Estate for about five acres at 15590 White’s Creek Lane. The change will allow for residential development. The council voted 5-0 to appoint Rick Floyd to the Brazos Valley Solid Waste Management Agency’s board of directors. Mayor Mooney adjourned the meeting. The council meets again for a special meeting on Monday, Oct. 2. The next regular meeting is Thursday, Oct. 12. Thanks for joining us. Good Night! Colin Killian (@ColinKillian) has been with the City of College Station since 2010 after 23 years as associate media relations director for the Texas A&M Athletics Department. Killian has also been a reporter and editor for the Corpus Christi Caller-Times and Lewisville News. A native of Hobbs, N.M., he graduated from Texas Tech with a bachelor’s degree in journalism/political science.